www.stilltimecollection.co.uk/ I remain sceptical that the 1948 forward control conversion was entirely carried out by Mann Egerton as production examples from Austin began appearing shortly after the Earls Court Show, though it may well be that the Norwich based coach builder put pressure on, and collaborated with, Austin in bringing the model to the market. 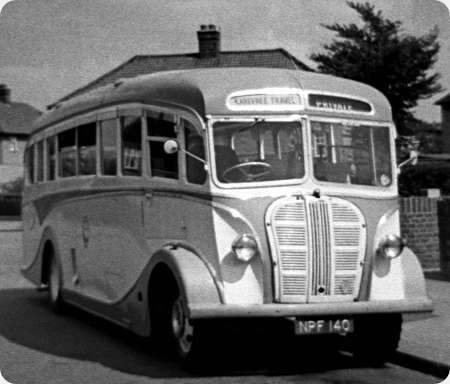 The standard coach bodywork by Mann Egerton for the forward control CXB was given the name “Norfolk” and was distinguished by its curiously sculpted front end to which the standard Austin radiator grille (an upsized version of the shape employed on the cars) was rather incongruously attached. 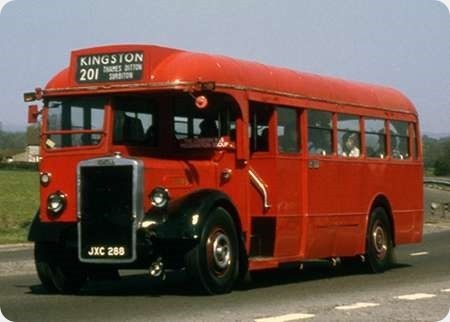 The result certainly lacked the businesslike appearance of the Bedford SB that appeared in 1950. Somewhere around 1953 the Norfolk body became rather more stylish, but the Austin coach was then in its twilight days on the home market, though exports continued into the 1960s. The 1947 bonneted Austin CX series originally had a 67 bhp 3½ litre petrol engine, but from 1948 this was upgraded with a 68 bhp 4 litre unit. The gearbox was a four speed synchromesh, which compared favourably with the crash box of the Bedford OB, but, unlike the Austin, the Bedford had servo assisted brakes and remained the more popular type by far. NPF 140 shown above was photographed in the large Croydon council estate of New Addington in 1960, and bore the trading name Karefree Travel about whom I know nothing. The livery bears a close resemblance to the 1948 Show exhibit – could it be the same vehicle, I wonder? 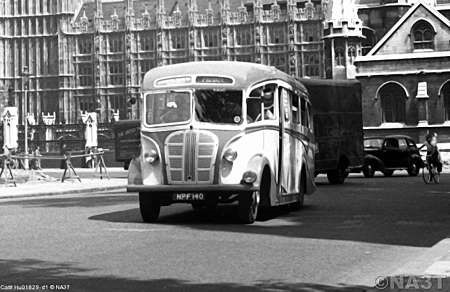 It can also be seen in this 1950 shot taken in Parliament Square. In John Carman’s excellent book, AUSTIN K SERIES BUSES & COACHES, the following information is shown. John Carman’s book has an appendix of all the known Austin K series (including the 3 way van based K8) It also explains in detail the different designations. Amazing that a postwar 31-seat coach should have no servo braking. As with the Bedford OB, the appearance of this Austin coach suffers from the narrowness of the front track, which shows up to particular disadvantage in the lower photograph, but even with a full-width front axle the top-heavy, ungainly body design would still spoil the whole effect. Why were just-postwar builders and their customers not content with simple, unpretentious, straight-waisted bodywork that sat easily on the chassis instead of appearing to crush it? The CXB chassis deserved better! Thanks too, Roger, for the fascinating link. I have one of the forward control model of these and I see that, whilst the log book doesn’t specify the chassis type, the chassis number itself is prefixed CXB. Don’t know if that helps. That’s useful, Peter. Could we see a photo and some history of your rare vehicle and how you came to acquire it? Chris. I regret to say that my knowledge of the history of the vehicle is limited. The reg. no. is MAF 544 so presumably it came from a Cornish operator. Chassis is CXB139946. As much as I know of the histroy is that it was acquired by Colin Shears at some stage and subsequently sold to someone who I think came from Plymouth. After it had spent a number of years outside, the would be preservationist decided that it was too far gone and returned it to Colin. I then acquired it from Colin. The bodywork was beyond salvation and went to Barnsley packed inside a Leyland National. I did keep some of the more iconic panels in case anyone wanted them. The chassis is being renovated. Thx, Peter, for taking the trouble to post the photo and what history you’re aware of.It’s always sad to see old vehicles reach this stage, but doubly so when they are rare to start with. Saving the chassis is, nevertheless, a fruitful enterprise. Good luck with that. There have been many previous references to Sheffield PD2s including those bodied by Leyland, Weymann/MCW, Roe and ECW but as far as I know, the small but rare order for two buses from Mann Egerton hasn’t been mentioned. 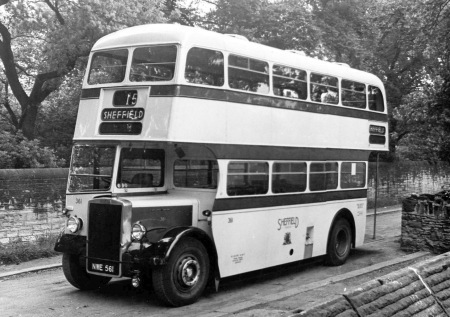 These buses enjoyed the usual thirteen year life with Sheffield prior to selling on. Tom Robinson of the Sheffield Transport Study Group comments and I quote "362 went via a Barnsley scrapman to Paton’s of Renfrew. Paton was so pleased with the bus he immediately tried to buy 361 which was at the same scrapyard. Alas it was in the course of being scrapped. In time ex 362 was cut down to single deck. The result of a fire, I think, and used as a tow wagon. They really were impressive and heavy vehicles. The saloon woodwork was especially opulent." The Roe PD2s were the first of many bodies from the Crossgate works. They were NWE 586-594 but were delivered earlier, in 1951. I suspect the reason for both bodies being higher seating capacity was that they were (Sheffield’s) earliest vehicles to 27′ rather 26′ length. Despite many comments to the contrary, even by eminent experts, there was a standard – but not standardised – Sheffield bus. [During most of the ‘fifties it was either a Regent or Titan with either a Weymann or Roe body.] It changed with time and the demise of certain companies but a lot of the post war interest was with the "distress purchases" when, especially Weymann, could not meet demand. Occasionally the distress purchases turned out to be gems – true of these two Mann Egertons. There are two magnificent green London Transport Ts on the Rally Circuit (9.6 powered Regal III – a single deck RT) which attest to the beauty and quality of Mann Egerton’s work. Mann Egerton were better known as the Norwich Austin dealer and they bodied many early post war Austins as small coaches, but the London Transport work did no harm to their reputation and their balance sheet. Very handsome vehicle, especially in that fine livery. Had no idea that Mann Egerton had ever built d/deckers. Sad that 361 was broken up after such a short life: if they were heavy then they must have been pretty robust too. Ian, they are supposed to be the only deckers they ever built. They did get as far as building underfloor coaches as well – including a pair of AEC Regal IVs for Creamline of Bordon Hants. Stephen. Can’t find 362 on flickr. They were certainly unusual looking, and stood out, especially with that slightly recessed panel at the front where the destination boxes were, which was unique in the fleet. But to my mind, they weren’t nearly as handsome as the OWB-registered PD2/10’s (656-667) alongside which they ran regularly on the 69 service joint with Rotherham Corporation. I seem to recall the two Mann Egerton’s sat down at the back end quite noticeably, especially when they had a good load on, but perhaps that was just a perception. Ironically, one of the PD2/10’s, 666, was cut down to a gritter/towing vehicle by STD, just like Paton’s ended up doing with the former 362, and in its sheared off form, G56, as it became, was kept busy for many years, considerably longer than the fourteen years it served as a bus, towing all kinds of disgraced rear-engined machines back to Central Works from wherever they’d decided to expire. And it always looked quite happy doing it! A smart bus, indeed – but does anyone know why these had the sunken destination screen box? I know some pre-war and early post-war Sheffield buses had this feature, but it was by no means universal. It would be interesting to speculate that, had Mann Egerton ever tried to sell d/d’s to LT following on from their successful PS1s, then this large screen box area would be almost the same proportions as that used for the roof-box RT! A quicker link to the ex- 362 picture Stephen. Is it just me, or can anyone else see a distinct resemblance to Roberts bodywork (also very heavy!) sct61.org.uk/da86 ? 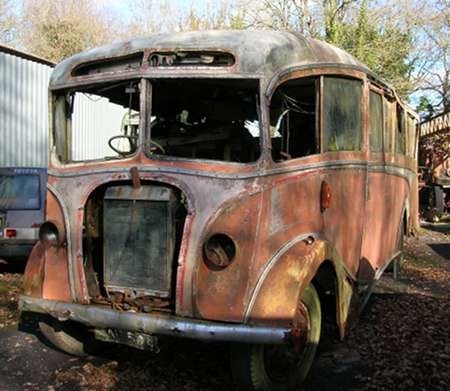 Apparently Glasgow Corporation FYS 494 fleet number D66 was a Daimler CVD6 with a Mann Egerton H30/26R body, new in 1951, scrapped 1960 and rebodied with an Alexander body from FYS 488 fleet number D60 which was a Daimler CD650, (10.6 litre with power steering) but chassis scrapped, not a very popular bus that one. Glasgow Corporation received a Mann Egerton bodied Daimler CVD6 double-decker in 1951 – D66 (FYS 494). Why do people eulogise the Mann Egertons and their contemporary Roberts Regent IIIs – let alone their mainstream Weymann and Roe cousins? They were beautifully made, well made and looked good. The lightweight Orion and similar PRV/Roe offerings were the reaction to these heavy bodies. I ask you, what would you prefer? The recessed destination display was, indeed, a pre-war Sheffield feature. There are echoes in the 1949/50 Cravens/Regent IIIs – featured on this site earlier this year. The most interesting manifestation was on the immediate pre-war all Leyland TD5cs, which had to have non-standard small upper deck screens to accommodate it. It was also a feature of the 1936 Cravens/TD4cs and "broke" the blue line under the upper deck windows. Weymanns managed to get the display in without either recessing the display or breaking the line. Some post-war bodies managed to "avoid the line" in the Weymann manner but most encroached into the line surrounding the number display without breaking it. Significantly, the 1953/4 PD2/Weymanns avoided the line, like their predecessors, but the subsequent 1954 Regent III/Weymanns "encroached" in the normal post war fashion. Hours of scrutinising photographs has not yielded a satisfactory answer to the question, Why? Dave. Couldn’t agree more. 656-667 were my favourite PD2s. In Classic Bus 110 I asked if Sheffield was the only order for M.E doubledeckers. The reply, and a follow-up in Classic Bus 112 will probably interest those who have responded above. The reason that Sheffield ordered the two Mann Egerton bodies is quite interesting. In November 1949 a tender was advertised for 30 double deck buses, complete chassis and bodies or chassis only or bodies only. At the time, all the STD PD2/1’s delivered since 1947, carried Leyland bodywork. The Leyland management advised the transport committee to "look elsewhere for bodywork"
In consequence, an intended order for 30 buses to the forthcoming new regulations of 27′ x 7’6" was varied. The result was that an order for 10 NCB, 2 Roe and 2 Mann Egerton bodies were contracted. Surprisingly, Leyland offered to supply 16 complete vehicles to the existing 26’x 7’6" PD2/1 standard. Unfortunately, NCB ceased trading, and Roe were awarded another seven bodies. The balance of the outstanding 11 (9 Roe 2 Mann Egerton) were built on the PD2/12 27’x 8′ chassis, authorised in 1950. This batch of 11 replaced 13 trams for the City to Fulwood tramway abandonment. Therefore the original 30 require was reduced to 27. Quite a complicated situation! So, Keith, Leyland were anticipating pulling out of coach-building that early and at the same time were already showing signs of their later take it or leave it attitude. Thanks for the insight. You may or may not remember me from our time together at BCT, but that’s another story. Newcastle Corporation had a batch of 5 Daimler CWA6 vehicles delivered between 1945-47 that received new Mann Egerton bodies in October 1950. They had been delivered new with second-hand bodies transferred from 1931 vehicles. Mr Anon, Newcastle had 5 Mann Egerton bodied Daimlers, they were fleet numbers 1 to 5, JVK 421 to 425.